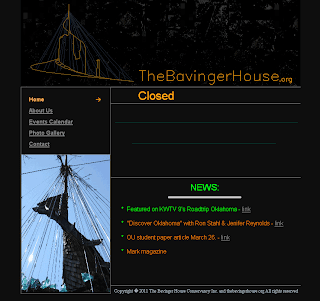 Rumors began circulating Monday afternoon that the Bavinger House in Norman, Oklahoma had been demolished. Conflicting reports have been circulating today and confirmation has been difficult due to the heavily wooded area where the house is located. Bob Bavinger, the son and steward of the Bruce Goff-designed house, contacted area galleries and asked them to remove any flyers or brochures related to the Bavinger House. Shane Hood with Modern Tulsa contacted modernisti in the Oklahoma City area to confirm the rumors. Lynne Rostochil was able to contact Bob Bavinger who claimed the iconic structure was "torn down and hauled away" sometime last week. However, this morning Terri Sadler is reporting she can see the roof and support cables, which would indicate the house is intact. Late Tuesday reports that indicate the house may have been compromised surfaced on Facebook. We'll continue posting updates on Facebook as we learn more. Since 2008 a number of efforts had been undertaken to raise funds to restore and maintain the Bavinger House. The tours and fund raisers have met with modest success. Currently the website is still active with an ironic one-word message. Closed. This morning we're hearing the house is still standing. Hopefully this was a hoax or someone's idea of a publicity stunt. I really hope this monument has not been demolished. The latest word is the house is damaged, but not "torn down and hauled away" as was claimed. The website has been updated late today with a blurb about storm damage- which is perfectly plausible because a microburst blew through Norman last week. But pictures and reports seem to indicate the central spire of the house is pitched over. Considering the Maypole-style construction that probably means serious problems.